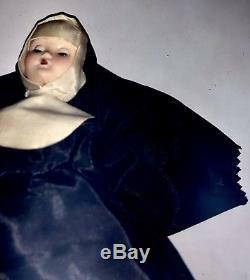 One of a kind Vintage Active Haunted THE NUN (Sister Patricia Barry) 7 tall Nun doll. 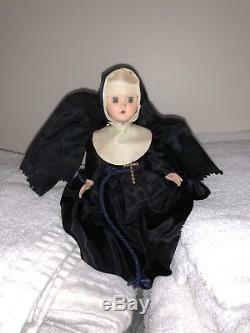 This doll was a relic of Sister Patricia Barry who professed her vows to the Church & the Lord in 1954. Two years later she was sent by her church to look into a young man age 13 whos family believed he was possessed by a spirit. 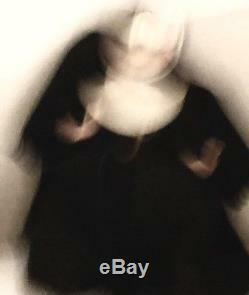 Apon arrival to the familys 3 level home, Sister Patricia Barry noticed a strange strong awful rancid putrid odor, it grew stronger as she was led into the bedroom of the 12 year old boy. Sister gagged from the stench and felt a strong evil presence in the room as the stood up dropped to his knees shaking violently. His head cocked back, eyes rolling in back of his head and red what appeared to be blood ran like tears down his face, his iris now completely dark black as he started to speak a foreign language that no one had ever heard before, his tongue flopping out of his mouth, spitting blood at the nun. She held her cross out and threw holy water splashing the boy, his skin boiling and burning as he screamed then went limp as if the spirit had left his body. He was pronounced dead by medics. 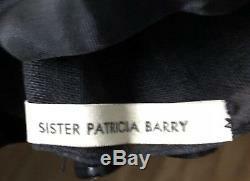 The spirit a mischievous evil one entered Sister Patricia Barrys body. Her eyes going completely black and her voice changing deep often growling. Sister ran from the house and disappeared into a wooded area. Police searched the woods but could not locate her. 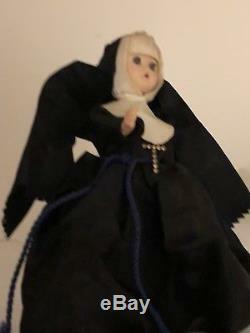 3 months after moving into the home, the mother found a 7 vintage doll of a Nun. Inside of her abbot it is marked Sister Patricia Barry, I believe in the 1950s at her ceremony the doll was given to Sister Patricia as a gift from her great-aunt who was immensely proud that Patricia had chosen to surrender her life to the lord. 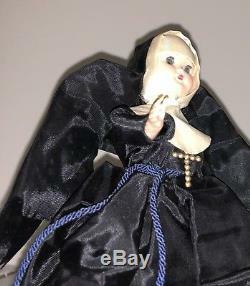 The Doll has a blue yarn cord to tie her abbot and a small cross on her chest. 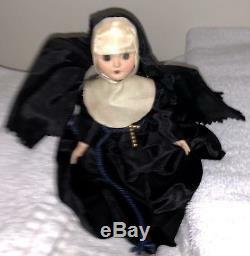 Made of plastic and possibly a custom effanbee doll, she is in overall excellent condition. Her eyes change to a creepy black in photos and when the spirit is worked up or angry. She had mysteriously appeared in rooms or places she never was before and had no way of getting into. 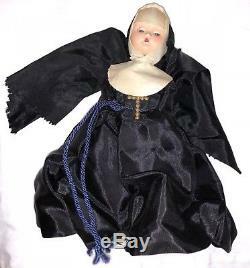 Take time to look at her photos I took, she showed her spirit side to me several times during the photo shoot and it is very evident in the photos, I believe this Nun doll to be a one of a kind Vintage Haunted active relic and wish her to go to a home who knows how to handle and take care of a spirit of this kind. 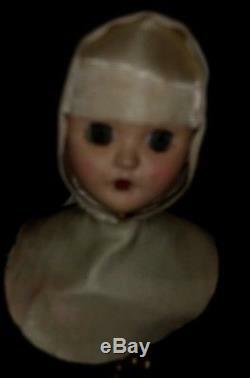 I wish the new owner the best of luck with the haunted doll and if you have any questions please message me. 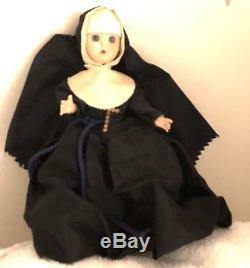 The item "Vintage Active Haunted The Nun Sister Patricia Barry Nun Doll Rare OOAK" is in sale since Sunday, September 9, 2018. This item is in the category "Dolls & Bears\Dolls\By Material\Porcelain\Contemporary (1980-Now)\Other Contemp. 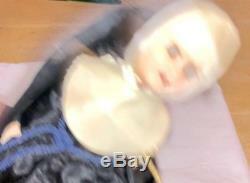 The seller is "clement2591" and is located in Norwich, Connecticut.